Rivals Louis Thorn and Harry Yamada make up the daredevil flying act, Eagle & Crane, until life grounds them and Harry is sent to a Japanese internment camp, leaving Louis behind to piece together how Harry’s body came to be found in a crashed plane. Historical fiction set in 1950’s California. Premise of daredevils in a flying circus. I really liked Suzanne Rindell’s last book, The Other Typist. The Flying Circus – The parts of Eagle & Crane that revolved around the barnstorming daredevil flying acts of the 1930’s and 1940’s were truly amazing. When the act came to their small California town, both young men were drawn to the allure of flying and everything that went along with it. Through a series of dares and one-up-manships they made themselves indispensible as wing walkers and flying stuntmen. What made it so incredible was that the two did their stunts without in any way being tethered to the plane itself and with absolutely no formal training! Can you imagine? It was almost too much to believe, but a little research shows that was exactly how it worked back then. 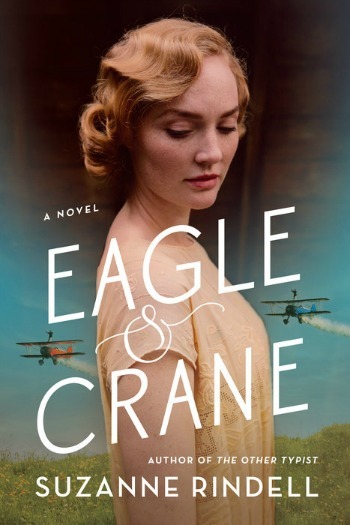 Strong on History – Besides getting the Flying Circus right, Suzanne Rindell did a terrific job with the other historical aspects of her third novel. She set her book in California’s Central Valley, where my grandparents owned a ranch, and though I didn’t know the area that far back, everything about the setting felt accurate. The storyline around Harry and his family and the suspicion they came under after the bombing of Pearl Harbor was a reminder of just how wrong we’ve been in the past. Harry and his sister were born in California and his parents had lived there for many, many years contributing to the community. And yet, they were stripped of all they owned and essentially sent to prison. Very real, very sad, and frighteningly current. A Love Triangle – Both Louis and Harry were drawn to Ave Brooks, stepdaughter of the act’s owner. All three were very young and inexperienced, not knowing quite what to do with their feelings. Add to that the facts that Harry was Japanese and that there was much bad blood between the two young men’s families, and you have a perfect set up for tension, young love, and heartache. The Mystery – While I thoroughly enjoyed the historical side of Eagle & Crane, I had a harder time with the mystery side of it. In the opening pages a small plane crashed in the field below Louis’s home. In the charred wreckage were the bodies of Harry and his father, who had recently escaped the internment camp. Tied into the rest of the book was the mystery of what happened to them and why this crash occurred. Sadly, many of the elements of the mystery and the investigation surrounding it felt forced to me. Like pieces of a puzzle that don’t quite fit together, but are crammed into place anyway. Believability – Some of the key elements of the story surrounded Earl Shaw, owner of the flying circus. I found his character to be a little too much of a heavy-drinking, gambling, dishonest charicature. But, even moreso, I found it almost impossible to believe that the others in the troupe (including two older, more experieinced pilots) kept falling for his schemes over and over again. Elements of Loius’s story also felt like a stretch to me. I’d thought he’d grown, but then he’d revert back to the black and white views of the rest of his family. He frustrated me. Roosevelt’s Declaration of War – The text of Roosevelt’s speech declaring war on Japan was included Eagle & Crane. I’m not sure why. Perhaps it was to give context to the anti-Japanese feelings of the era, but it wasn’t needed. I pretty much skipped it, as I suspect other readers will do. The Other Typist by Suzanne Rindell – Rindell’s lat book also combined historical fiction with mystery, but I liked this novel set in 1920’s NYC I little more. When the Emperor Was Divine by Julie Otsuka – A powerful novel telling of the experiences of Japanese Californians moved to internment camps in the 1940’s. Note: I received a copy of this book from the publisher, G.P. Putnam’s Sons, and Edelweiss in exchange for my honest review. Can’t believe that I’m saying this because of the books I love hahah, but sometimes in hist fic, I feel like they try to add some mystery and it’s simply not necessary and most of the time it ends up being quite predictable!! I agree. I’d be curious to hear what you’d think of the mystery in this one. I love reading books in this time period and it sounds like Suzanne Rindell wrote about a different side of it. I’m excited to read it! The barnstorming element was something I’d never read about and I enjoyed (and was surprised) by much of it. It sounds like the author tried to jam too much into this novel — when it wasn’t needed. I wasn’t a huge fan of The Other Typist so I will likely skip this one, though the historical fiction parts surrounding the times & flying do interest me quite a bit — especially being set in California – my home state.